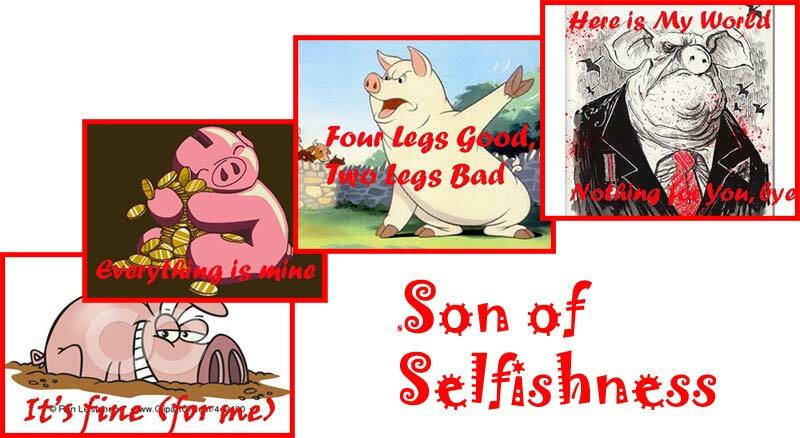 Big Pig is a fatty beast or what we call wealth, fund, or “Son of Selfishness”. At this moment, this God creation seems perfect in wisdom since he was the anointed by High priest that made him believe he was God. Thinking himself to be wise, he became a fool and tries to down the earth. Pig Father is cruel and hates Humanity to Divinity. To set Animal Farm, he puts human in bottom because he knows that human is HIGH even younger, weaker, or less property then bring the worst beast, dull but aggressive buffalo to control the entire Farm. If really Big and High, he is giving and down-to-earth. Super-Stereotype: Big-Small, Waste-Wealth, Fat-truth. He killed “Son of God” proposing the Nobel Prize to save the world: Pigs and Dogs compensate to human in 2003 so the world has never got A Right Solution until today. If BIG is beautiful, why the world is uglier and dirtier?